YOUR INVESTMENT IN OUR STUDENTS IS ALSO AN INVESTMENT IN OUR WORLD. WHITTIER STUDENTS RECEIVE AN EDUCATION THAT PREPARES THEM TO TACKLE SOCIETY'S BIGGEST CHALLENGES. Whittier College was founded on a commitment to community, service, and a respect for people of all backgrounds. This commitment continues through this day and is manifest in our curriculum, the students we matriculate, and our outreach to our neighbors in Whittier and the surrounding areas. Sustaining this legacy and propelling Whittier College forward requires the generosity of alumni, parents, and friends investing in the College's uncompromising commitment to deliver a distinct, high-quality, liberal arts education. Supporting Whittier comes in many forms—through a wide variety of giving opportunities and numerous volunteer roles. 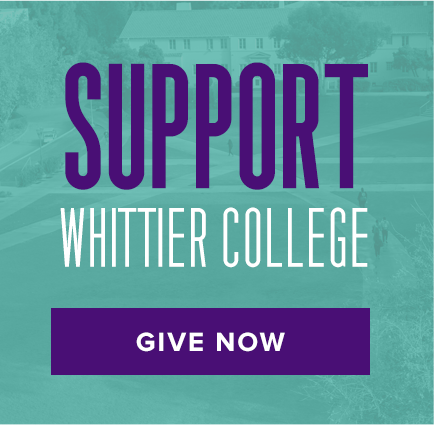 Your investment of time, money, and energy on behalf of Whittier will benefit students of today and tomorrow. And, you will have an impact on others in ways that may exceed your expectations. Aside from giving back to the next generation of students much as others did for you, there are two critical reasons that your support makes a difference. Becoming a Proud Poet Parent is a fun way to get involved on campus and connect with senior staff, while ensuring Whittier's academic tradition.